When Cardinal Vincent went on to the bridge of a large ship unloading cars, the captain asked him to bless rosaries, prayer cards and booklets that had been placed beside a candle on a small table. As he did this, some of the 22 crew members who had gathered to meet him took photos to send back to their families in the Philippines, Singapore and Myanmar. They had never had a Cardinal on board before. Cardinal Vincent was in the port of Tilbury in Essex, situated 25 miles downstream from London Bridge, and one of Britain’s three major container ports. He had come to learn about the work of Apostleship of the Sea (AoS) and meet its Tilbury port chaplain, Wojciech Holub, who is based at the seafarers’ centre. July 12 is Sea Sunday, when the Church asks us to pray for seafarers and support the work of AoS, whose chaplains and ship visitors provide practical and pastoral help in ports around Britain. 'It was a great pleasure to be on the quayside and near the sea, because quite a lot of my youth was spent in Liverpool, where I was very familiar with the docks and would be down at the sea most days,' said Cardinal Vincent. During his visit, wearing a high-vis jacket and a red hard hat, he met a number of seafarers, most of them working nine-month contracts on ships, which mean they see little of the families. 'To see the men who work on these huge ships in a way I’ve never done before is really very impressive. I appreciate their professionalism and dedication and the sacrifices they make to support their families,' he said. 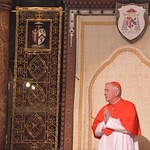 Cardinal Vincent also went on board a ship loading grain to take to Spain that evening. 'I was surprised to learn about the speed with which ships turn around and the limited opportunities crew members have to get off the ships and to do the things you can’t do on ships, such as shop, go to church, get medical attention if they need it and contact their families at home. He added that a greater appreciation and knowledge was needed about the key role seafarers play in our lives. 'Nearly 95% of what we consume in Britain arrives by ship. We are utterly dependant upon shipping to continue and to prosper. So we should be more aware about those who serve us in this way and of the way Apostleship of the Sea supports them.